With the greatest of joy, we announce the inauguration of a brand new Chubeza distribution route to the Herzlia/Ramat Hasharon area. Tell your friends and acquaintances that we will begin regular deliveries to these two cities every Wednesday. Mazal Tov to all! The little prince crossed the desert and met with only one flower. It was a flower with three petals, a flower of no account at all. We haven’t been getting very wet over the past few weeks. The constant showers we enjoyed at the beginning of winter have dwindled to a drizzle a week. We’re not complaining. Last week we received a nice allotment of rain on Monday which saturated the earth, and at the end of this week we’re hoping for more precipitation. The soil needs more to drink, and we are loathe to bid a premature farewell to winter showers. We take heart in the fact that we’re only in the middle of winter. There’s still two to three months to expect rain in our land. One of the vegetables that signals the middle of winter is the parsley root, which takes some time to reach maturity. Though we seed it in the beginning of autumn, it is only ready for harvest in the middle of winter. This is a vegetable that always brings us great joy when it finally arrives. The parsley root then joins her good friend and distant cousin the celeriac, which we plant and do not seed, thus he arrives sooner. This week we turn the Newsletter spotlight to these two spectacular roots. Although their growth is concealed, when they finally emerge there’s robust reason to bring out the soup pot and celebrate (and not only with soup)! Both the parsley and celery roots belong to the umbelliferae family (along with the carrot, coriander, dill, fennel and others). They perform a double duty for your soups: they’re yummy and filling to munch on, plus they add fragrance and flavor. Each of these roots has a green, stalk-like and faster growing “twin brother” growing above earth (leaf celery and parsley greens), which grow faster and assume different roles in the kitchen. This week we’ll go a few inches under and talk about each member of the root duo. Every plant needs roots and leaves, of course, and each component works in opposite directions. The roots draw up the nutrients from the earth, and the leaves act as conduits to transform sun rays into available energy for the plant. This is why all parsley and celery have leaves and a root, but celeriac and celery leaves, as well as parsley root and parsley leaves (and you can add the beet root and Swiss chard greens or beet greens) are two different types of the celery/parsley/beet plants, and not simply different parts of the same plant. Every parsley leaf boasts a root, and every parsley root has leaves, but the leaf parsley is satisfied with modest, thin roots and does not develop a thick root, while the parsley root has thicker and rougher leaves. The varieties of leaf parsley and parsley root were developed over the years by farmers in the ongoing process of selecting preferred species and cultivating them. Some farmers kept seeds from year to year from the plants with the biggest leaves, yet the mildest or best taste or highest resistance to extreme temperatures or pests. Other farmers kept the seeds of plants whose roots thickened and lengthened. Thus the segregation of the species was born – differentiating the parsley grown for its leaves from that which we call “root parsley,” a savory delight to add to the soup. The flavor of parsley root has been described as a combination of celery, carrot, parsley and turnip. In short, something distinctive and indefinable. Best to just go ahead and taste it! Parsley root is somewhat sweet, but also earthy (as are most roots). For those who are familiar with the parsnip (a long and elongated root, confusingly similar in appearance), note that the parsley root is not a parsnip! 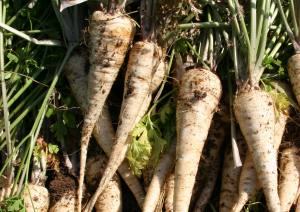 Though it looks a lot like the parsnip, the parsley root’s flavor is very different and less sweet. 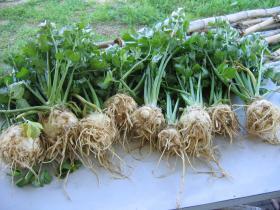 Both stalk celery and celeriac are domesticated species, meaning that they were cultivated over hundreds of years. Farmers sought celery’s thickened root, selecting from season to season only those varieties which produced the chubbiest, biggest roots, or rather the round roly-poly roots. For these plants, the stems remained short and thin, with a far more pronounced taste than the mild flavor of stalk celery. Often the stems are hollow, like a straw. When you look at a bed of stalk celery alongside one of celeriac, it’s easy to identify them by the different way the leaves grow. The former are erect and long, the latter chubby and spread out. Celery is a plant which grows slowly. It starts with its teeny, tiny seeds which take their time, three to five weeks, till they sprout. After their diminutive sprouting, they need at least another two months of devoted care in the warm, pampered temperature of the plant nursery. Only after three or more months are they ready to be planted. We receive the young’uns when they’re approximately three months of age and ready to be lifted out of their black plastic cubes and placed in Chubeza’s fertile earth. Celery loves fertile earth and lots of water. 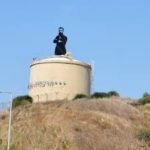 As a plant which originated in the swamps, it likes humidity in the earth and also in storage, which is why it thrives in wintertime in Israel. The Israeli summer is difficult and dry for the crisp celery plant. After three months in the nursery, it needs another three months to reach the prime age at which its leaves and stems can be harvested. The specie which develops a thick root is even more patient, waiting another month under the cozy cover of Mother Earth and refusing to be coaxed out of its warm bed to the cold, raging winter. A simple calculation leads to the conclusion that the lovely celeriac visiting your boxes this week began its growth some six months ago! And even when their time has come to ripen, the celeriac and parsley root still hold on to the earth with all their might, and are not easily convinced to emerge. When we harvest them, we use a pitchfork to loosen the earth surrounding the parsley roots, or a knife to gently cut the slender roots surrounding the celeriac. Upon removing them from the earth, we attempt to shake them well to release the remaining clumps of earth still caught within. After this initial cleansing, we march them proudly to our vegetable washing tubs where undergo a momentary soak. Even so, when these roots arrive in your boxes, you will most likely still see remains of dirt. Immerse them in water for some 30 minutes to expedite the final cleaning. Holding these two yummy roots in your palms, you surely feel the urge to race to the kitchen to prepare some soup. But wait! First have a look at the great suggestions in our recipe section for a variety of delectable uses for these unique roots. A must! 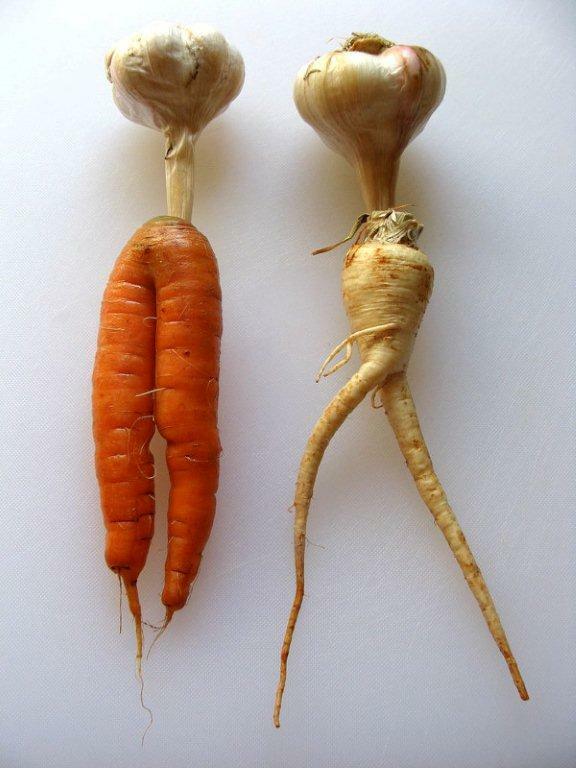 Monday: Scallions/fresh onions w/ greens, celeriac/parsley root, cabbage/cauliflower, Swiss chard/kale/chubeza (mallow) greens, cucumbers, tomatoes, carrots, bell peppers, kohlrabi/fennel, potatoes, broccoli/Jerusalem artichoke. Large box, in addition: Fava beans/snow peas or garden peas, turnips/beets, coriander/mizuna/dill. FRUIT BOXES: Bananas, avocado, clementinas, pomelit, oranges. Wednesday: Fresh onions w/ greens, celeriac/parsley root, cabbage/cauliflower, Swiss chard/kale/chubeza (mallow) greens/broccoli greens, cucumbers, tomatoes, carrots, kohlrabi/fennel, potatoes, broccoli, parsley/coriander/mizuna/dill. Large box, in addition: Fava beans/snow peas or garden peas, white turnips, beets/Jerusalem artichoke. FRUIT BOXES: Bananas, avocado, lemons, pomelit, oranges.